If you’re suffering badly from the curse of the neighbours from hell, you may be able to breathe a sigh of relief very soon, due to the prospect of new legislation that will enable beleaguered residents to get their stress-inducing neighbours evicted speedily for causing a real nuisance. The process of getting a problem neighbour evicted has been painfully slow in the past, even when neighbours have been involved in really antisocial behaviour, and under new rules, certain ‘offences’ will automatically give the authorities greater powers to evict troublemakers, especially if the problem neighbours are indulging in illegal activities. 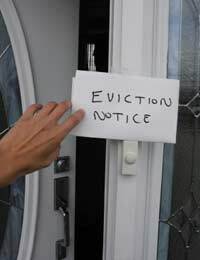 It’s been estimated that around 3000 tenants a year are subject to eviction proceedings because of their antisocial behaviour, but the process of actually evicting them is lengthy and can take up to seven months. This means that the behaviour carries on, making the lives of the other residents a misery and giving the troublemakers even more opportunity to wreak havoc. Evicting problem tenants is also extremely expensive – in some complex cases ousting a 'neighbour from hell' can cost in excess of £20,000. As recently as July 2011, it was reported that an Oxford family had finally been evicted following two whole years of complaints from their neighbours about their swearing, loud music, fighting and even allegations about prostitution. In Peterborough an elderly woman claimed that she had become a prisoner in her own home for ten months after a new neighbour moved in and began a hate campaign against her. Housing minister Grant Shapps announced at the beginning of August 2011 that he planned to dramatically speed up court processes – some of which have been known to take over a year. To counteract this, he plans to introduce new mandatory possession powers which will allow any past convictions that a problem tenant has for serious anti-social behaviour to trigger off eviction proceedings. This should mean that the process of evicting antisocial neighbours will be sped up and give the rest of the neighbourhood a break from their antics. Any conviction for a serious housing-related offence – these would include criminal damage, violent behaviour against neighbours or drug dealing. Closure under a closure order - for example in cases where a tenant has been using a property for dealing drugs. Some of the powers being brought in to make life more bearable for residents, councils and housing associations include mandatory grounds for possession in cases of people who have an established track record of antisocial behaviour. These specific types of anti-social behaviour order will also be recognised in both criminal and civil courts, which will cut out the need for two sets of legal proceedings against troublesome tenants who have been indulging in criminal behaviour. Why are The Government Taking Action Now? The government have realised the misery that can be caused to law-abiding and considerate tenants just through the actions of an antisocial few, and have decided to level up the playing field and stop taking the rights of the people causing the problems more seriously than those who blatantly abuse their neighbours. It’s been decided that in extreme cases, faster action is needed to avoid situations where an entire neighbourhood becomes a no-go area, and the area goes downhill, just because of the actions of one family or even one tenant. Ministers are also keen to introduce probationary tenancies that will last for up to a year, enabling local authorities and housing associations to throw out problem tenants easily if they don’t behave properly and respect their neighbours. The moves have been welcomed by pressure group Neighbours From Hell in Britain, who champion the rights of residents blighted with problem neighbours. The group said that its members had been overwhelmingly supportive of any changes in the law which gave the police, councils and courts the powers to act swiftly. A spokesperson for the group said that individuals who were, or had been, living with problem neighbours agreed that the current legal process in place to deal with a neighbour from hell takes far too long. He added that the process didn’t support the 'victim' of the behaviour. A survey of 1000 victims revealed that half didn’t actually believe that antisocial behaviour orders made a difference, and said that noisy neighbours were the biggest problem. A government consultation, ‘A new mandatory power of possession for anti-social behaviour’ is available online on the Communities and local Government website. The deadline for responses to the consultation is 5pm on Thursday 27 October 2011. I live in a council rented flat. My neighbour is chronic alcoholic. He does not wash, shave or have a hair cut. He does not take his Waste to the bin and there lots ( 20? ) black bin bags piled inside his flat. As a result his flat and the 36 flat complex is infested with lots of tiny flies. The smell is horrendous. More worrying is the fact he smokes. Residents are frighten he will drop a lit cigarette on On of his bin bags whilst he is (constantly) drunk and cause a fire. The Local Council ( Berneslia Homes) have done nothing positive to evict or stop this anti-social and dangerous behaviour. Is there anything other residents can do? We have a neighbour who smokes repeatedly in the property below ours. The property is a non smoking property but the landlord and managing agents have done nothing about it. He also has a lodger who has bought dogs into the property, the dogs foul in the garden and on the pavement. There are also concerns of drug dealing from the property. Please help. Just wanted some advice about my upstairs neighbor, he's drug dealing and I installed a CCTV camera in July and caught him buying drugs outside my flat door, downstairs the communal hallway.Am on my own and afraid, that he's doing that outside my flat door. Don't know what to do, some advice please, anyone. It started with the neighbour above. She would rearrange furniture - wooden - dragging them on her wooden floors. Had no concept of time and would get her washing machine going at night. Or noise so loud I would hear it outside and next door. So after many different unhelpful council officers have visited upstairs put in carpet in one area and agreed to put in floor covering elsewhere. After their visit the flooring was removed and they commenced deliberate noise making every evening as soon as I get in after work. They then befriended the family from hell. And this is when it got uglier. This is a family that treats my front and back gardens as a dustbin; chicken bones, waste food, used condoms, sanitary towels, tampons, clothing, shoes, underwear, hats, wine bottles, lager cans, cigarette butts, and one of those security tags! The security tag went to the local police station and one of the horrors next door (local drug dealer) disappeared for a while.Now, a broken fence has been dumped in the front garden and in the back they now have waste water flowing into my patio. Could be from their washing machine as it looks sudsy. This started 3 Sundays ago. And this family do not work and so they open and slam shut every cupboard and every drawer most nights so that my sleep is always disturbed. I'm now back on antidepressants as it is all too much. I have simply had enough. My son is having trouble with his upstairsneighbour and has done for 2 years now.shouting and screaming at boyfriend at unsociable hours at night and day druggies and other people calling at unsociable hours night. My son is in poor health with this situation and it has flared up his anxiety.He has reported this neighbour to local council and antisocial department but nothing has been done. My son is going to court on Tuesday to see what he can do about getting this this person evicted. Any help has to what he should ask for would be appreciated. My council tenent neighbour physically attacked me , she admitted to police she assaulted me, it has been ongoing for yrs then finally the attack, I now fear to leave my home will she be evicted? I live in a convete house with a flat below and above me. The guy down stairs plays music early hours in the morning before work which I don't mind at all as I believe that if you make sound then I can to. Same goes for the lady upstairs or so I was thinking. She has wood flooring in her flat and I can hear her walking, using the shower talking etc andbanging early hours in the morning. Every single day. Normally 11pm when she goes to sleep and early hours in the morning. Are floor and Celin are very thin and you can hear everything. My problem is this. I work 6 to 7 days a week every week and once or twice a month I like to have friends over for a meet up when I get a weekend off. No party or anything just friends having a chat and a few drinks. Baring in mind I work late hours ever other week. I did come to an agreement with the upstairs tenant which I stuck to, and i still stick to. This is once every other Friday night. most times as I've been doing a lot of overtime at work i wouldn't see my friends for over a month. I had friends around 3 weeks ago on are agreed day (friday) she is complaining now I have received a notice about noise nuance. I can't understand this due to are agreement it's also infuriating that I've been trying to live with her everyday noise but I have one night that ends usually about 2am in the morning. And she complains? I would like for some kind of advise on this situation as it's now becoming a problem that I've been living with her noise but I can't have a convo with a few friends for one evening after two weeks of long shift work. We also live next to Clapham Junction station so the sound of trains is always present. I can't hear my tv at night due to this and trying to keep the level of sound down when I get home from work. But I also hear her upstairs banging and walking around even as I'm typing this she's walking around with what sounds like shoes on wood flooring and I have work be at work for 7am tomorrow morning. Any and all advise would be greatful. To none and ellyphant, Can relate to both of your experiences and am very sorry. We have had the neighbours from hell for the past ten years. They are long term tenants whereas we have a mortgage. Where to start, abuse, swearing - both adults and children, bottles thrown at fences, our children, car, their wider family and friends joining in, fences smashed, blocking us in the list goes on and on! They have mocked my problems with depression and have no thoughts for anyone except themselves and their gang of loyal fellow alcoholics. Keep hoping they will move but landlord is a greedy old tax dodger, and they are crafty! None We had the very same problem. Vile vile neighbours. They destroyed just about anything we had including our sanity. Letters from the Council made them worse. The only way out was to downsize property. The council found us somewhere within a week. After 12 blissful years of peace we now have a very large annoying Roma family that has ruined our peace again!!! My elderly parents have horrible neighbours. My parents don't keep in the best of health and their neighbours who are also retired seem to get a kick out of their failing health.They mimic and ridicule them, swear and give hand gestures and call them names and cause no end of problems, captured on cctv. It goes quiet for a while then it all starts again. The community police are aware of things but when they say they will get in touch they never do yet Tonight the police appeared at my parentsdoor.Next door had reported them for trimming the garden hedge in october to keep it tidy.The hedge is on my parentsown boundary and is being trimmed by a professional tree cutter due to the fact they cannot do it themselves.Police said they had to come out because they had reported it but also said there was nothing they could do. We've all lost faith in the police. They won't come out when you need them yet they come out for silly things. I am having lots of problems with a tenant next door to me. He parties all day and nights with his druggies. screams andparty daily. This has been going on since he moved in in 2012 till2015. I keep reporting it to landlord but they say their hands are tied and can't evict him due to no other witnesses. In the mean time he's harassing me and abusing me by kicking my wall and screaming. Any advice would be appreciated. Thanks. Hi this is about my daughter she lives alone with her son a young women with a baby moved next door to her my daughter my related to her as she is also a single parent then the neighbours mother moved to the other house next to my daughter she is now is sandwiched between the two houses well the husband of the woman has come out of prison and they have been bullying my daughter the mother slapped my daughter across her face for moving her bin so she could get in the car .the police were called about the assault on my daughter had did nothing the father threatens my daughter with violence he has also threaten my grandson .my daughter has an eating disorder and cause of this is thin and they take advantage of this to bully her the police did not charge the mother for assault even though it happened in the street in front of neighbours .i have lost my trust in the law a victims rights count for nothing .she has been through the council and agency's to help her my grandson is in his last year at school but he falling behind cause he is so worried for his mum they say go to this place and that place but these people don't give a dam. We completed a mutual exchange to our property but now things have become very apparent why she was so desperate to move, the first week here was great, I truly thought we had landed on our feet but things had gone downhill at a very fast rate which has set off my anxiety and panic attacks (had been doing very well for a long time) It seems my neighbours house is the 'go to' place for all the local teenagers to gather and have loud parties that literally shake the windows drink and drugs... Thursday night it got that extreme I had to stay at my mums for the night, when we were leaving they were mimicking the 'meltdown' I had (I had a previous problem a few years ago when I complained about neighbours and they threatened to burn down my flat!)... There is no time frame as to when this happens, like just on a weekend or in the evening, it can literally start at any time of any day so I am constantly living on edge waiting... Now for the bit that really worries me, the backlash from these people. They are really not nice people and very much have the 'I am untouchable' attitude. I had a friend round the other day and her daughter was looking through my fence into my neighbours garden, they threw a bottle at her, I have been told that they blew up a car belonging to someone that dared to go against them. I have spoken to all the appropriate authorities, I have put a complaint in against their HA, spoken to my HA ( although they say they cant enforce any action as they are not their tenants) my children's schools, environmental health, doctors and am currently waiting on the local PCSO to call back who have all been fantastic and said they can write reports if needed. I have been told my best option is to move but because the local council see us as adequately housed that is by no means a quick fix, or I have the option of another mutual exchange, but it weighs very heavy on my conscience the thought of bringing in another family to this situation, although at the same time I need to think of the safety of my family and my health. I get told 'hopefully they will be evicted' but that worries my because they know where I live! I cant even let the children out to play in the garden without me because I don't know what will happen, lets face it, they think nothing of throwing a bottle at a child and blowing up a car, what else are they capable of?! I really cant think straight to see a way out of this... Sorry for the long winded post but i literally feel trapped! Hi, we've had a neighbour who's had numerous loud parties, doors slamming, strong smell of cannabis, climbing balconies and just recently involved in an incident with a gun. We've reported this, however the housing association say they need other neighbours to report the incidents too. Despite giving them a police incident number. Is this correct, I would have thought something as serious as a firearm would result in a quick eviction... Any advice? Maybe try the police too? Call them on the non emergency 101 number. Hi, I've got 3 chronic health conditions; endometriosis, Crohn's disease and Lupus, so I need a relaxed and calm atmosphere to avoid a flare. The flat I live in I fled to while leaving an 8 year abusive relationship and I've been here 2.5 years now. About a year ago a young single lad moved into the flat next door to me and all was alright for a bit, some friends came round regularly but were polite to me (and still are to my face). But quickly things started to change, his friends were round at all hours making noise in the communal hall and buzzing my intercom in the wee hours, waking me up. Then people started coming round looking for him saying he'd stolen and damaged property, various people have smashed nearly all of his windows and they knock my door asking about him also. He's had underage people in his fiat drinking and taking drugs, I've had people asking about him dealing drugs. Then my flat got broken into a few months ago and I'm terrified. Neither he nor his 'guests' have ever directed any animosity towards me, in fact they're quite nice and polite to me, but given their overall demeanour and criminal behaviour I find that more concerning (I have a criminology degree). I'm mostly concerned that someone hunting him down may target my flat thinking it's his and myself or my cats could be hurt, or I could become a target if I reported his behaviour, I can't have police at my door as he knows them all (a huge red flag if his police interactions)!! Unfortunately, the police are really your only option here, if moving elsewhere is not a feasible choice. "As recently as July 2011, it was reported that an Oxford family had finally been evicted following two whole years of complaints from their neighbours about their swearing, loud music, fighting" - After over three years of living directly beneath a couple who would argue and smash things around at any given hour, door slam, blast out music so loudly I couldn't hear my laptop with my ear right next to it, and who more than once intimidated me when I asked them politely to try to show some consideration, 2 years would seem miraculously fast here. Though they did finally move out - To be replaced with a much more quiet, dangerously aggressive alcoholic. I dare not get my hopes up this legislation makes it into law, and my housing association (for the first time in memory) do something to improve the quaility of life for the residents here.